Each commentary focuses on a particular element of drum history – whether it be a particular drummer, groove, recording or piece of gear – and brings it to life in a whole new way. So go ahead, click on one of the topics below . . . you might find yourself suddenly interested in “history” like you never were in school! 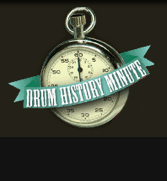 Check out this incredible internet piece on the origins of breakbeats. Turns out that many of today’s best known breakbeats derive from the drum part of a 1960s soul tune called “Amen, Brother.” Warning: This piece lasts about 15 minutes, but is totally worth it! Get the scoop behind the first official smash of the rock era. Get the skinny on one of the most enduring rock beats of all time. Special thanks to C.G. Ryche for his very fine job of recording and editing the Drum History Minutes.